We have a long weekend. Four whole days of it! It’s like we’re in continental Europe or something. And why have we had this bestowed upon us? Because the Queen’s been Defending the Faith longer than Jamie Carragher, that’s why. Is anything happening in West Hampstead to celebrate E II R’s lengthy Game of Thrones, I hear you ask. Why yes, yes it is. There are a few local events, so I thought I’d better put them online for you. I’ve heard rumour of other odd street parties, but don’t have the details – do please feel free to add your local events (Kilburn and West Hampstead only please) in the comments section at the bottom. If you’re into drinking and live music more than cucumber sandwiches and bunting – but still want to capture that Jubilee vibe then you’ll want to spend your evenings at The Alliance’s Coronation Weekend Party. On Saturday, Sunday AND Monday, there are a series of free gigs. On Saturday, Boz Boorer (who some of you will know plays with Morrissey) will be DJing and there’ll be a “very Special Guest Star” live on stage! More live music on Sunday with Florence Joelle and her band from 8pm and on Monday, Carlos and the Memphis Flashers are playing. Lyn Boorer hosts the weekend and there’s a Jubilee style menu over all three days. And it’s free. Did I mention it was free? More traditionally… On Saturday afternoon, West End Green (that’s the small one up near the fire station, some people always ask) will host the W.HEART Jubilee Lunch. You actually bring your own lunch, but there’s entertainment planned all afternoon and Camden’s new mayor will be there at about 2.30pm. 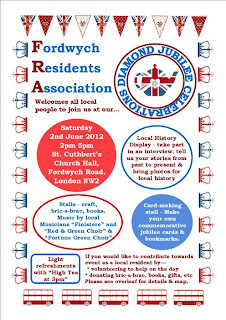 Also on Saturday, the Fordwych Residents Association is holding a Jubilee celebration in St Cuthbert’s Church (just south of Mill Lane) from 2-5pm. There’ll be stalls, light refreshments and “High Tea” at 3pm. 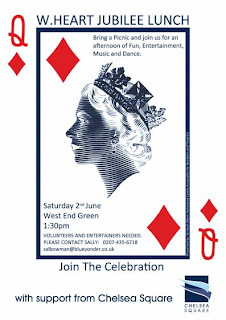 On Sunday, the Friends of Fortune Green are holding a Jubilee Big Lunch starting at midday. 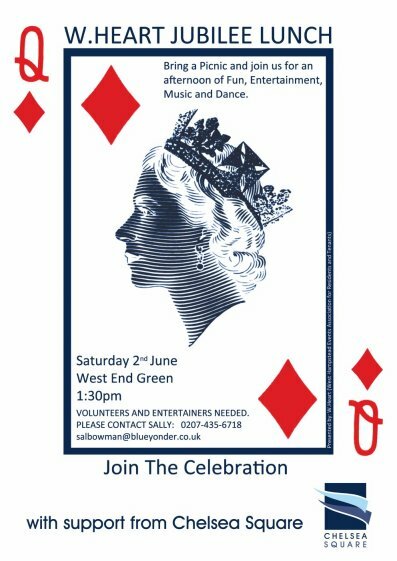 They provide sausages, soft drinks, plates, cups, napkins, bunting, entertainment and children’s activities including a magician and a project to build a cardboard Windsor Castle (flammable stuff, cardboard – just saying). You provide: yourselves and a dish to share, savoury or sweet. Please label your dish so people know what they are eating. If you want to make a cake bring it along and it will be entered for the Fortune Green bake-off. They’re also asking if people could bring along a big teapot if possible. Presumably for some nursery rhyme reenactment… or for tea. Definitely one or the other. If it rains, the event will be in the playcentre at the north end of the Green. The FoFG have a good track record of Big Lunches. 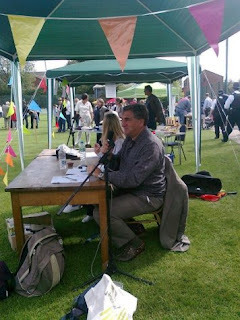 Last year they held a Big Lunch to celebrate the improvements to Fortune Green and over 200 local residents joined in. On Monday, why not take a break from bunting waving and head to The Good Ship in Kilburn for the first of the Edinburgh preview shows. £4 if you reserve (yes, just four pounds) or a fiver on the door to see Fran Moulds, James Acaster and Johnny & The Baptists. So, to recap. Three previews of shows that will be at the Edinburgh Fringe where you’d pay full price for EACH ONE. Instead you can see all of them here for £4. There’s also a raffle, the bar stays open late, and the excellent Ammis Curry is even on hand to keep your appetite sated through the night. 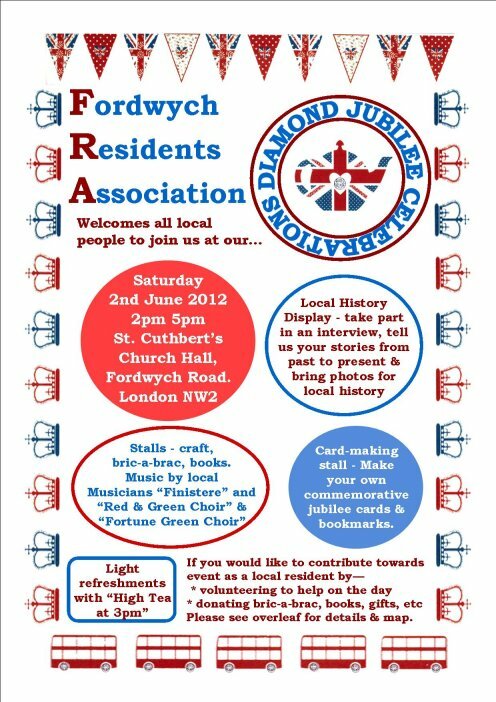 On Tuesday, the Lymington Road Residents Association are hosting a Jubilee Party that starts at 12.30. There will be numerous stalls serving a variety of hot food, cakes and drinks, a bouncy castle, face painting, a live band and more. The event will take place both on Lymington Road and in the LRRA Hall at 1 Dresden Close. 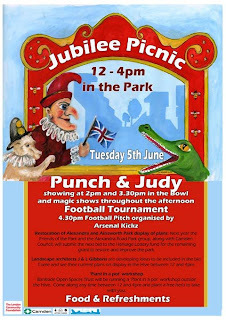 At the same time, Alexandra & Ainsworth Tenants & Residents Association is holding a Jubilee Picnic from 12-4pm in the park with Punch and Judy (aka Phil and Liz, surely?) and a football tournament.